A new report from Pennsylvania State University has discredited longtime claims by pro-GMO corporations that GMO crops allow for reduced use of agricultural chemicals. The authors of the study point out that those who claim GMO crops have decreased insecticide use “do not seem to have considered seed treatments, and so may have overstated reductions in insecticide use.” This is referring to the large category of insecticides called neonicotinoids, which are applied directly to seeds and then get dispersed throughout the plant’s stem, leaves, flowers and pollen as the plant grows. These treatments were not previously taken into account in mainstream pro-GMO reporting. However this new study indicates that, when neonicotinoids are included, the trends show a major increase in the amount of US cropland treated with toxic chemicals since the mid-2000s. These chemicals could be considered even more harmful than those sprayed or surface-applied in the more traditional fashion, since they literally pervade every cell of the plant. Neonicotinoids have been demonstrated to have high toxicity to bees, butterflies and other pollinating insects. The EU has severely limited their use due to the evidence that they harm bee colonies, while the US has not mandated any limitations. Neonicotinoids have also been known to harm human embryo cells, having been found in the blood of pregnant women and umbilical cord blood. Yet corporations promoting GMO crops assert that pesticides embodied in crops are safe. GMO expert Dr. Doug Gurian-Sherman explains, “In reality, corn engineered to kill certain insect pests – AKA Bt corn – has mainly resulted in the replacement of one group of chemical insecticides with another.” The new study supports this claim with hard data. This issue may be amplified by the concerning fact that pro-GMO companies already have control over the vast majority of seeds available to farmers and gardeners. Genetically engineering seeds gives companies an extra measure of control, because, once engineered, the seeds can be patented, making it illegal to plant these crops without purchasing the right to do so from the patent owner. 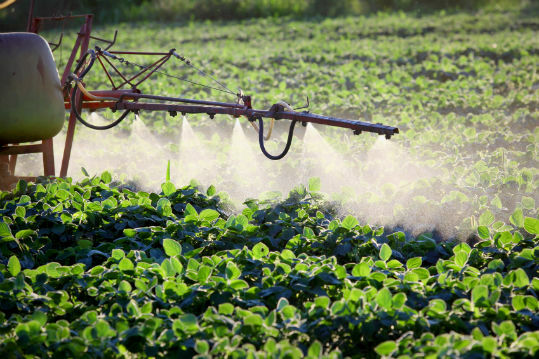 So how did this whole pesticide-reducing plan backfire? It turns out that GMO crops have caused new resistant pests to develop. Similar to the way that overuse of antibiotics has resulted in dangerous infections like MRSA, which are resistant to medication, the monoculture plantations of GMO crops have put pressure on nature and resulted in “superweeds” and “superbugs” that are resistant to glyphosate. This means that higher volumes of increasingly toxic pesticides are being applied to try to overcome new tougher pests. It is important for the public to hear that the increased cultivation of GMOs has done the opposite of what was promised. The use of toxic pesticides and herbicides has not been reduced, but rather has become ever more pervasive and surreptitious. This issue is part of ongoing contentions around mandatory GMO labelling in the US. Fight for your right to know whether you are putting GMOs on your plate, and vote with your dollars to help create change toward more sustainable agriculture practices. Hey Buddy!, I found this information for you: "Exposed: GMOs Don’t Use Less Pesticides". Here is the website link: https://www.thealternativedaily.com/exposed-gmos-dont-use-less-pesticides/. Thank you.